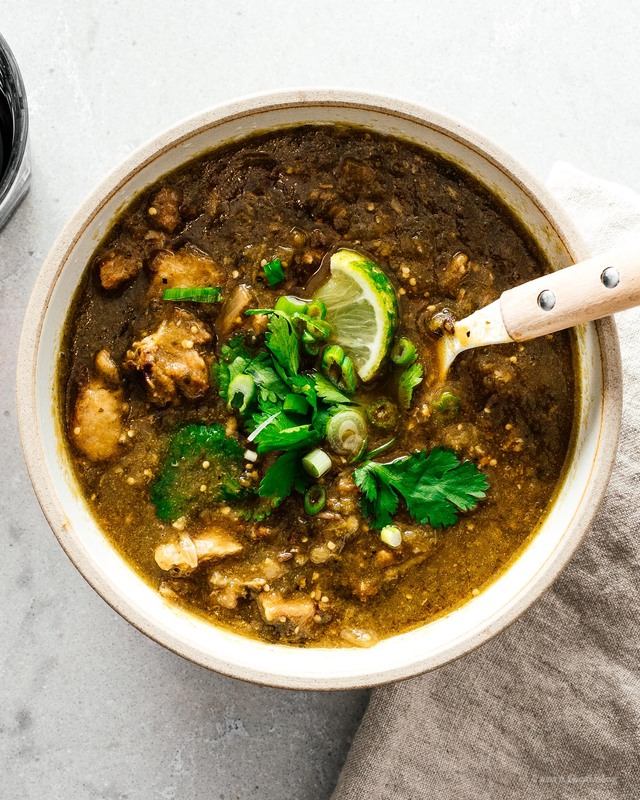 It’s a shame that not more people know about chile verde, aka green chili, because it’s one of the greatest stews ever invented, in my opinion. 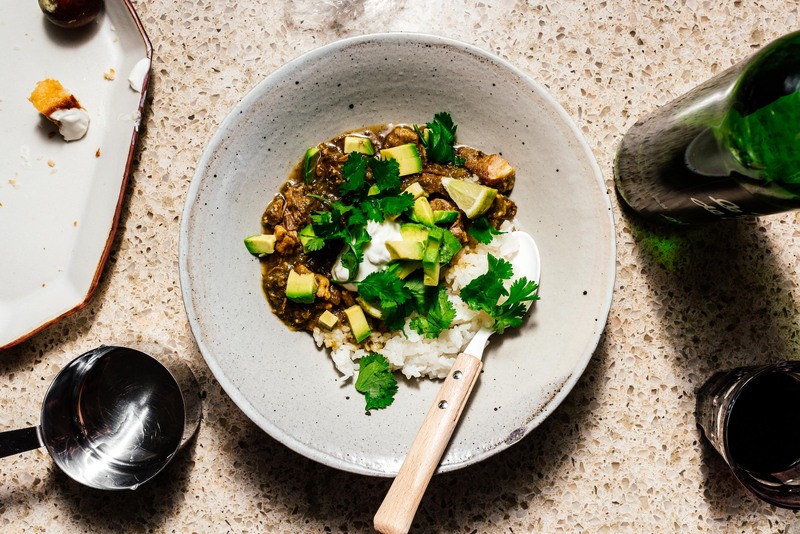 Smoky roasted green chile peppers and tomatillos and super soft chunky pork shoulder come together to make one of the most satisfying meals you’ve ever had in your life. This version is super simple, removing everything you don’t need and keeping only what you do. It’s not the easiest dinner & chill recipe, but it’s worth it! Browning the meat is a completely optional step that you can do while you wait for the peppers to roast, but it’s not necessary. You can also do a very lazy job of browning only one side which is what I do. Anaheim chiles are actually Hatch chiles that were smuggled out of New Mexico and planted in California. They don’t have anywhere close to the smoky heat that real Hatch chiles have, but they are close enough in the middle of winter. 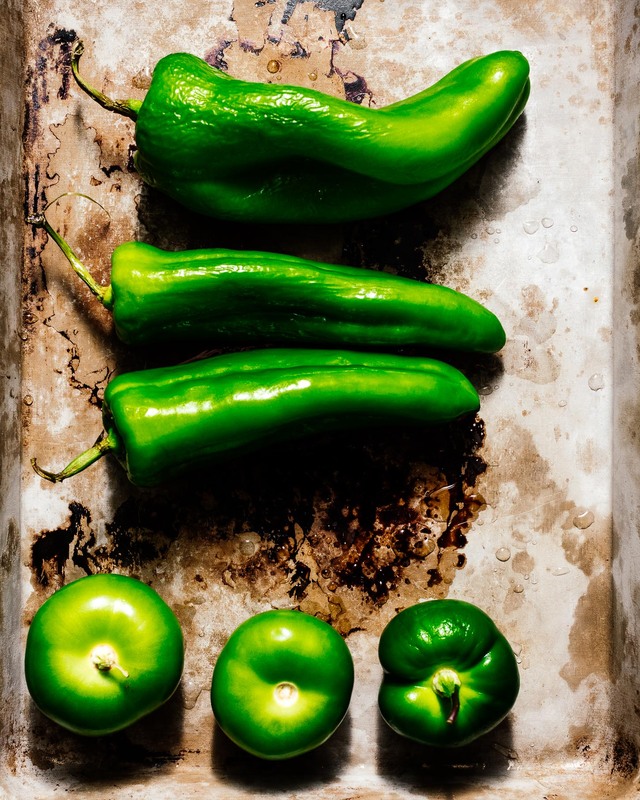 If you can’t find either, sub any large green chile, such as poblano or any other pepper roughly 6″ long. 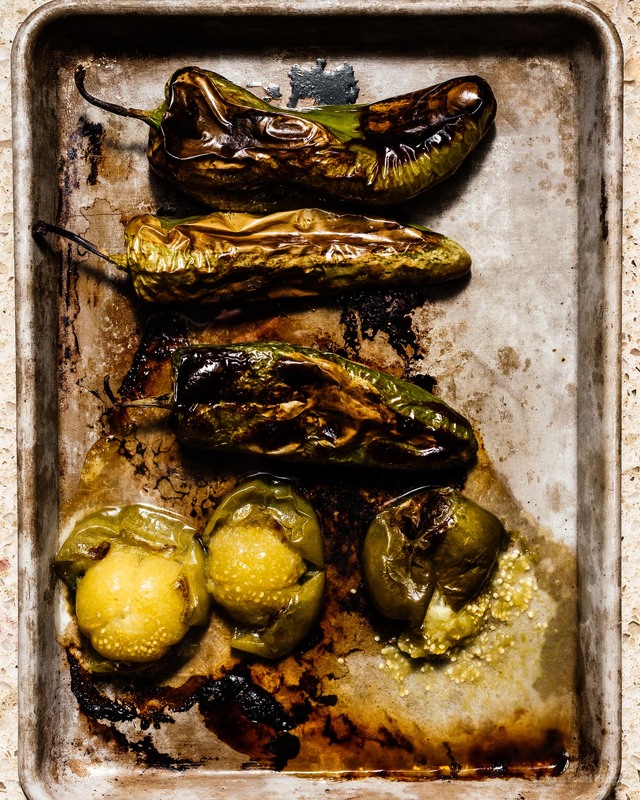 In a pinch, combine jalapeno and bell pepper. 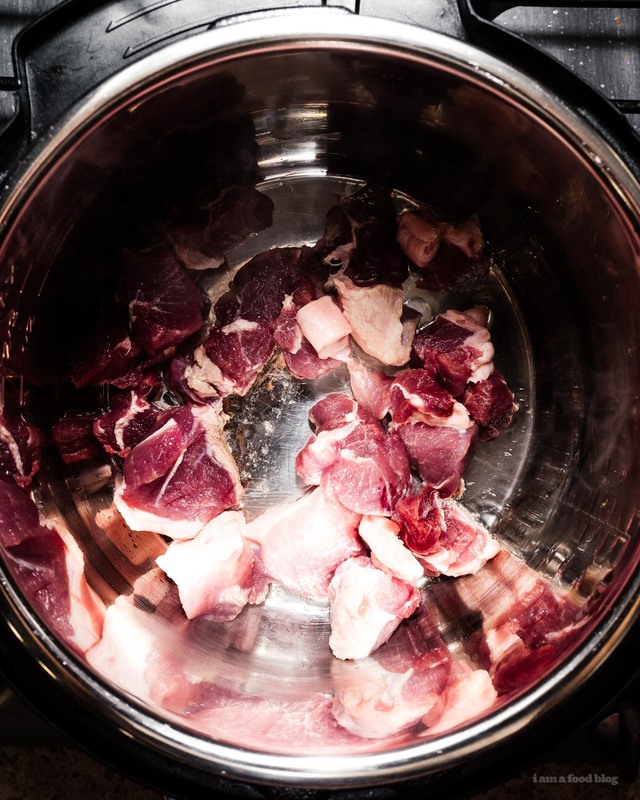 This recipe is for 1 pound of pork shoulder, but honestly Steph and I never find it enough. We double the recipe when we make it for dinner. An instant pot, a blender, and a baking sheet. If you don’t have a blender, crush the garlic and mince the cilantro to the best of your ability and just throw the rest into the pot, it’ll dissolve. If you don’t have an instant pot, this recipe will also work in a slow cooker, dutch oven, or regular pot, just double the cooking time. Serve with tortillas, rice, or just eat by itself. Topping with avocado, lime, and cilantro highly recommended. 1. Preheat your oven to broil/500ºF. Using cooking spray or neutral oil, coat the peppers and tomatillos and roast for 10 minutes, then flip and roast for another 10 minutes. 2. Season your pork with salt and pepper. 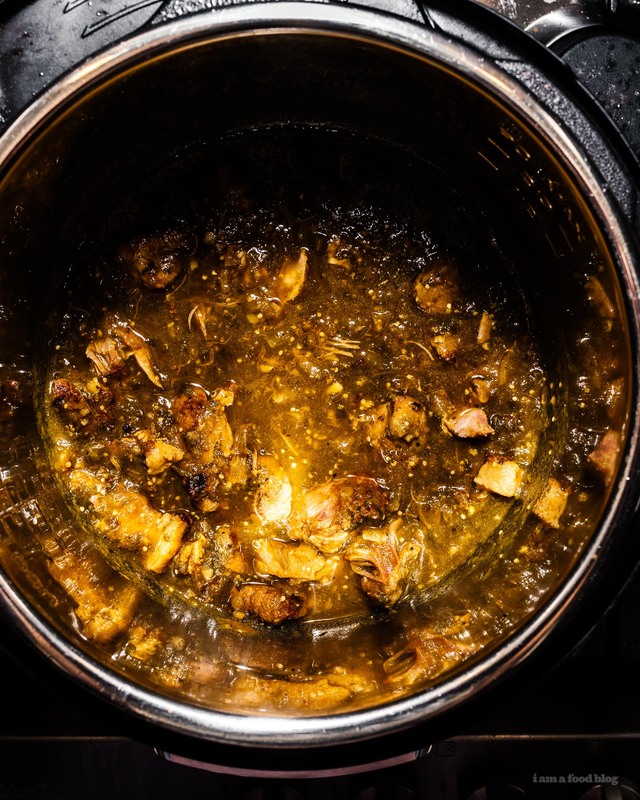 While the peppers are roasting, with your instant pot on saute high mode, roughly brown your pork shoulder in 1-2 tablespoons of oil. It’s not really necessary to get every side browned. 3. Add the onions. 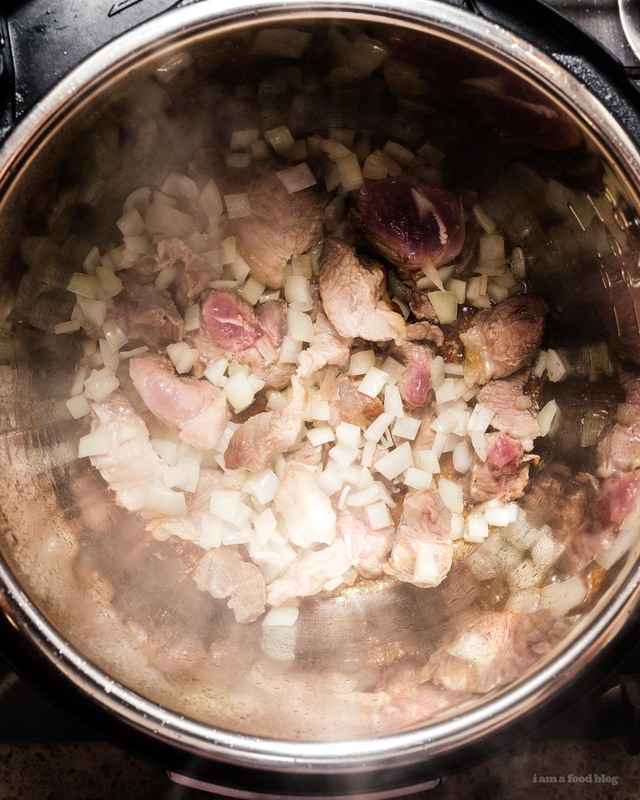 Reduce the heat to saute low and continue cooking until the onions are soft and translucent. 4. When the peppers are done, remove them and transfer just the 3 peppers to a ziploc bag to steam. After they are cool enough to touch (5-10 minutes), remove and peel the peppers. 5. 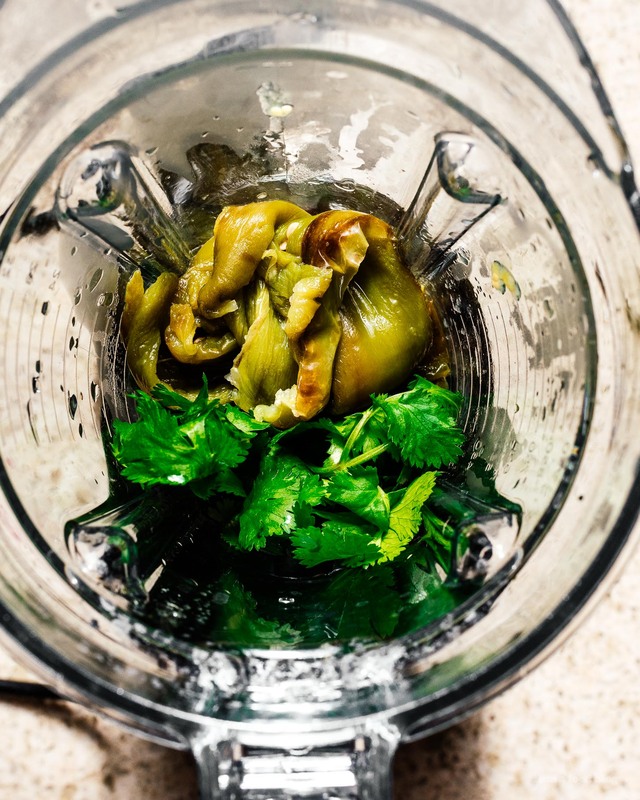 Discard the peels and transfer the peppers to a blender, along with the tomatillos, cilantro, garlic, and a pinch of salt and pepper. Puree and add to the instant pot. Add 1 cup of water to your blender and pulse a couple of times to get the last bits, then add to the instant pot as well. If you like your chili on the thicker side, only add 1/2 cup of water. 6. Cook on high pressure for 30 minutes. Quick release when done. Add the cumin, stir well, and adjust the seasoning with salt and pepper. 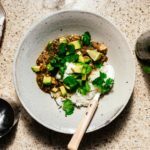 Top with lime, cilantro, and avocado, and enjoy!